Organize your full collection of dumbbells and switch from one free weight to another with the DBR-56 Dumbbell Rack from Marcy. This dumbbell organizer offers an easy way to keep your weight lifting equipment from piling up all over your gym. Reap the benefits of fat-burning and muscle-building training in the comfortable environment of your home by managing your equipment so that you don’t have to worry about cleanup after every workout. This dumbbell rack stand makes weight organization easy, allowing you to focus on the heavy lifting and not the clean up! Constructed from heavy-duty, 14-gauge steel, this gym organizer has a sturdy structure that won’t collapse under heavy loads. Its powder-coated finish effectively resists sweat and moisture to help prevent rust buildup over time, guaranteeing that this equipment is reliable and long-lasting. This weight exercise equipment offers multiple storage spaces around its dual-framed structure, allowing you to store dumbbells of varying sizes and styles. Store your steel and cast-iron dumbbells on the trays so that you don’t have to spend time picking up your free weights from different corners of your gym. The compact and low-profile design allows you to conveniently place it in any part of your fitness are without taking up too much space. The assembled dimension is 27L x 8.5W x 21H. Maximize your purchase and get the perfect investment for your home gym with this package that comes with a two-year manufacturer’s warranty. The Marcy DBR-56 Compact Dumbbell Rack helps you manage space. Invest in this equipment rack and experience the comfort of working out in a clutter-free home gym. The durable rack accepts both neoprene and cast iron dumbbells. Resistance training with free weights is one of the most efficient, effective ways to build strength and add muscle mass, and a weight rack like this quality, durable model from Marcy Fitness helps keep all of those loose weights organized and off the floor. The compact unit accommodates all dumbbell sizes and styles, including neoprene and cast iron, and is made of heavy-duty 14-gauge steel with a rugged, attractive powder coated finish. The rack measures 27 by 21 by eight inches (W x H x D) when fully assembled. Marcy weight racks include a limited two-year manufacturer’s warranty against defects in materials and workmanship. FREE WEIGHT ORGANIZER – Store your weights on a stand where you can access them quickly while keeping things organized in your home gym! The DBR-56 dumbbell rack features multiple trays that accommodate different sizes of dumbbells. HEAVY-DUTY STEELWORK – Keep all of your weights secure at all times with the Marcy DBR-56 Dumbbell Rack. Made from commercial-grade steel, its durable frame can withstand a heavy load while resisting damage from intensive use over time. DURABLE POWDER-COATED FINISH – Reinforced with a powder coating, this versatile dumbbell holder boasts a sturdy construction that won’t easily get tarnished with heavy gear. Its polished surface effectively resists scratches and minimizes scuffs. SLIM AND SPACE-SAVING DESIGN – Free up some space in your fitness area with this rack’s ergonomically designed structure. Its compact design allows you to place the rack in any part of your gym for easy access to your free weights. sturdy Love it. 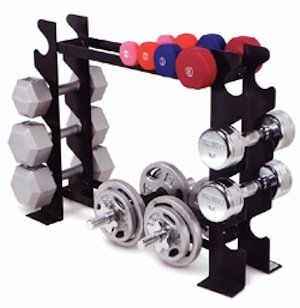 Quite sturdy, does not wobble when taking pieces on and off, and the middle section is great for organizing other gym equipment if you don’t have a ton of dumbbells. quite happy with the purchase!